The Gibbs Cancer Center, part of the Spartanburg (South Carolina) Regional Healthcare System, is 1 of 21 National Cancer Institute (NCI)-designated community cancer centers. Recognizing in 2007 that 85% of all cancer patients receive their care in the community, NCI set benchmarks for elevating cancer care in the community setting. A 10-year follow-up of the 2-part UK Standardisation of Breast Radiotherapy Trial (START) supports the 5-year findings, which demonstrated that a shorter course of adjuvant radiation therapy is equivalent to a 5-week course of radiation for women with invasive breast cancer. Two years of trastuzumab provide no benefit over the standard of 1 year of trastuzumab therapy for human epidermal growth factor receptor 2–positive (HER2+) breast cancer, according to an 8-year follow-up of the Herceptin Adjuvant (HERA) trial reported by Martine Piccart, MD, president of the European Society for Medical Oncology and chair of the Breast International Group, Institut Jules Bordet, Brussels, Belgium. Extending tamoxifen treatment for 10 years reduced the risk of dying by 29% compared with the standard 5 years of tamoxifen for estrogen receptor–positive (ER+) breast cancer, but these benefits of longer-duration tamoxifen did not emerge until the second decade after diagnosis, according to results of the international Adjuvant Tamoxifen—Longer Against Shorter (ATLAS) study. A 500-mg dose of fulvestrant improved survival compared with a 250-mg dose in women with estrogen receptor–positive (ER+) metastatic breast cancer with no increase in toxicity, according to an update of the Comparison of Faslodex in Recurrent or Metastatic Breast Cancer (CONFIRM) trial. I spent 8 long months in a city far from my own, undergoing intense chemotherapy and then an autologous stem cell transplant. Colorectal cancer (CRC) is the third most common type of non– ‒skin cancer in both men and women. “Sexual and intimacy issues are the white elephant in the room for women with breast cancer,” stated Susan W. Rafte, of the Pink Ribbons Project, Houston, Texas. 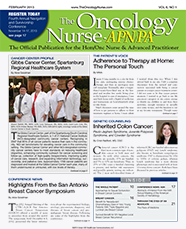 Young women with triple-negative and luminal-type breast cancer were more likely to respond to neoadjuvant chemotherapy than were older women with these cancers, and improved outcomes were observed for young women with luminal-A–like tumors who achieved a pathologic complete response (pCR) versus those who did not.